Joshua W. Miles, a.k.a. 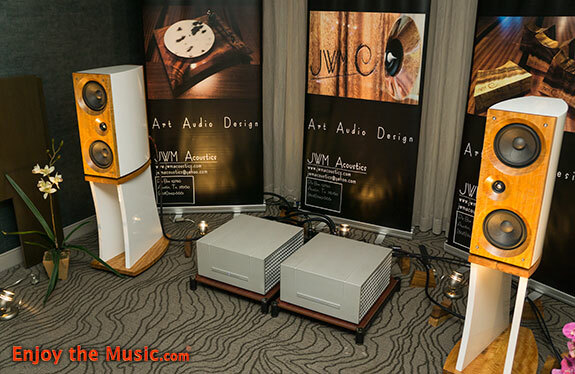 JWM, put together perhaps the most surprising room for me at 2017 RMAF. 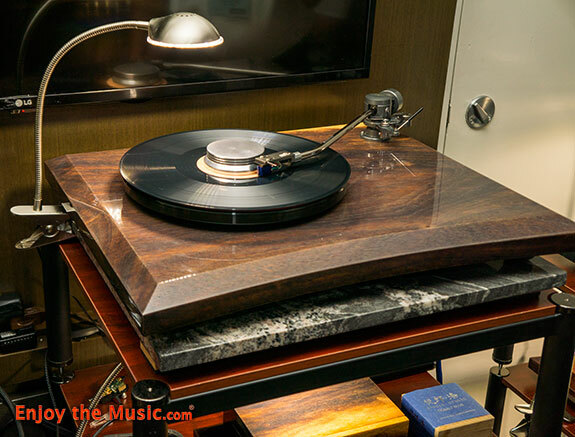 From the beautiful standmount speakers, JWM Alyson II Large Monitors ($8,500/pr) came the most dynamically exciting rendition of Ray Brown's Soular Energy track "Take the A Train" I heard at the show. I heard the album many times, both vinyl and digital, vinyl here played on a JWM KAREN 12 turntable with an Etsuro Urushi Cobalt Blue cartridge ($5,250), and it was the best I heard it anywhere. The stage was wide and deep with the Alyson's disappearing completely, extreme clarity with piano sounding particularly live displaying it's percussive nature having huge dynamics. The Alyson II monitors gave the sonic illusion of floorstanders minus the below 35Hz level, and nothing was missing on the Ray Brown tracks. 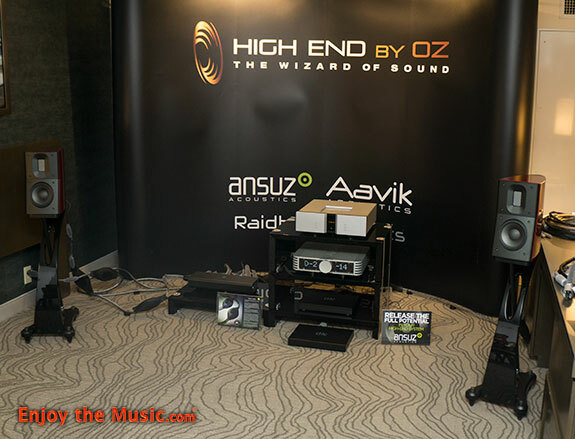 Clearly one of the very best rooms at RMAF 2017. 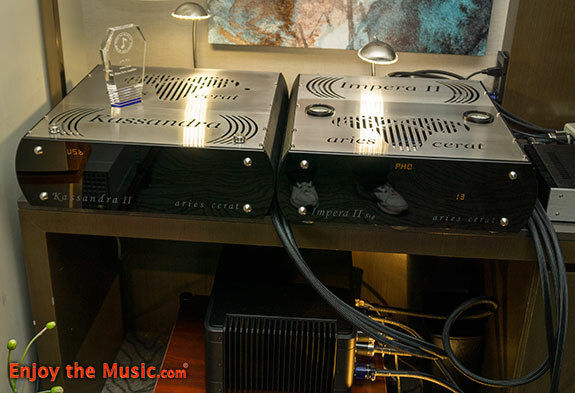 Contributing to the room's excellent sonics were an Aries Cerat Impera II Signature preamp, ($82,500), an Aries Cerat Kassandra Reference DAC II, ($35,000), and a pair of Constellation Inspiration 1.0 Monoblock amps. I still don't know exactly how Raidho gets such a big sound with such deep bass out of the very small box, but they do it every time I'm exposed to them. 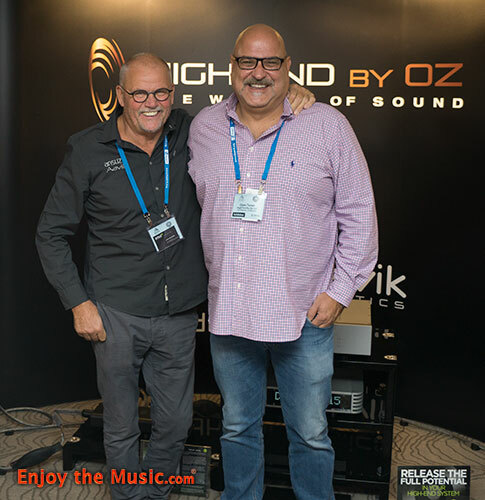 The West Coast "Wizard", Ozan Turan, who operates "High End by Oz" in LA was joined by Lars Kristensen representing Ansuz and Aavik in this spartan but terrific sounding room. Lars enlightened me about using a remote on your transport or CD player. Lars showed me a sonic difference between using the remote to start playing CD versus walking up to it and manually pressing the play button. He did this four times and each time the remote resulted in a slightly closed in, dynamically squished sound compared to a more open, wider stage, and more dynamically exciting sonics when the button was pressed by hand? 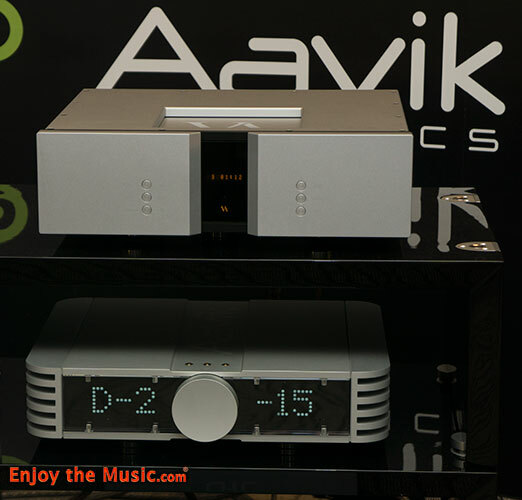 Lars was introducing the Aavik U-150 integrated amp, ($12,000), DAC-150 DAC module ($4,200) and Aavik Phono-150 Phono module ($4,200), which is a great looking and sounding all in one unit. 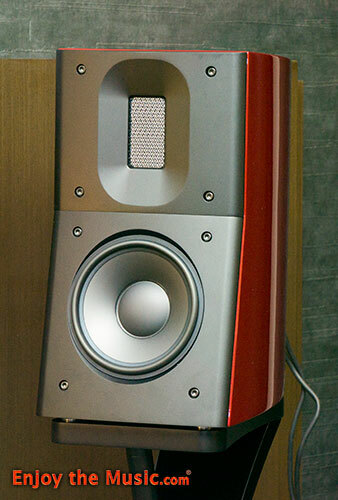 The wolves in sheep's clothing speakers were Raidho 1.1s ($23,000/pr) incorporating diamond drivers on matching stands ($3,300/pr) with diamond spike feet ($7,200/8 qty.). The room was cabled with Ansuz Cables in every position. I heard Dean Peer's "Mars" and it was involving, huge soundstage, staggering amount of detail, big dynamic swings, and bass that was tight and deep. Oz put on a vocal cut from Youn Sun Nah and her voice was tightly focused and very real sounding, just a wonderful room to explore new music in, thanks Lars and Oz.